Vasily Kandinsky's artistic personality had been formed in part by the examples of peasant painting he collected as a prosperous solicitor. When he later made his leap to full-time creative practice, he sustained his interest in the decorative principles of Russian and other folk art traditions. 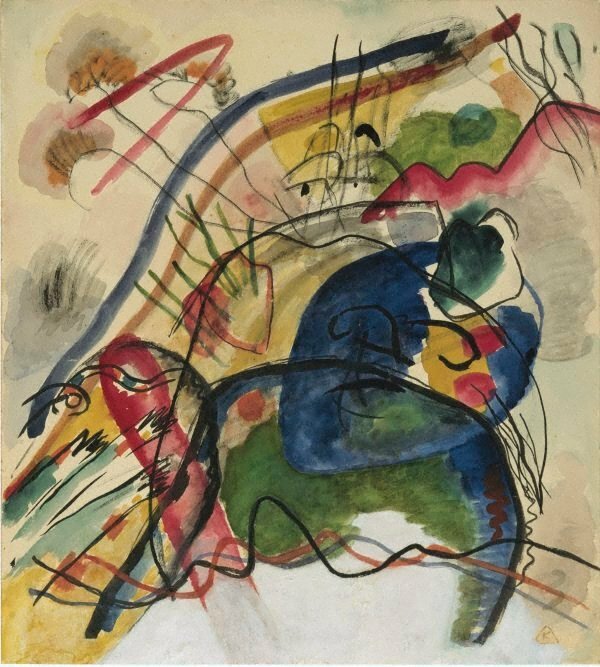 This watercolour study for one of Kandinsky's breakthrough abstractions of the pre-war period contains residual representations of a horse and rider: the primitive St George familiar from his earlier work. The background is a landscape complete with rustic village. Yet to read the image literally robs it of its power of association. Kandinsky's intention is to loosen reality from recognisability, to set it adrift. The new vista he unveils is in the realm of the spiritual and the resulting work of art is authentically abstract. With his fascination for theosophical and mediumistic beliefs, and his idealistic faith in the improving potential of painting, Kandinsky was as much a priest of art as a painter. Signed l.r., watercolour "K" [in a triangle monogram]. Not dated. J. van Assendelft-Hoos, circa 1931, Gouda/Netherlands, Information from 'Kandinsky Watercolours, Catalogue Raisonne, Vol. 1, 1900-1921' by Vivian Endicott Barnett, 1992 p.303. J.J.M. Schijvens, circa 1947, Zeist/Netherlands, Information from 'Kandinsky Watercolours, Catalogue Raisonne, Vol. 1, 1900-1921' by Vivian Endicott Barnett, 1992 p.303. Sidney Janis Gallery, Aug 1958-02 Jan 1959, New York/New York/United States of America, Acquired by Sidney Janis Gallery from E.J. Wisselingh & Co. summer 1958. Information from Sidney Janis Gallery 30 Mar 1983. Sotheby's London, 30 Mar 1982, London/England, Purchased by the AGNSW from Sotheby's London, 30 March 1982 "Highly important 20th century paintings", lot no. 7.